If you are investing online and have a taxable brokerage account, you need to understand how dividends work. Remember that a dividend is a distribution of a portion of a company’s earnings to some of its shareholders. Dividends can be issued as cash payments, stock shares, or even other property. Dividends are paid based on how many shares you own or DPS (dividends per share). If a company declares a $1 per share dividend and you own 100 shares, you will receive $100. To help compare the sizes of dividends, investors generally talk about the dividend yield, which is a percent of the current market price. A company’s net profits can be kept within the company as retained earnings. A company may also choose to use net profits to repurchase their own shares in the open markets in a share buyback. Dividends and share buy-backs do not change the basic value of a company’s shares. Dividends must be approved by the shareholders and may be a one-time pay out, or as an ongoing cash flow to owners and investors. Start-ups and some high-growth companies such as those in the technology or biotechnology sectors rarely offer dividends because all of their profits are reinvested to help sustain higher-than-average growth and expansion. Microsoft, for example, did not pay a dividend until it had already become a $350 billion company, long after making the company’s founders and long-term shareholders multi-millionaires or billionaires. Larger, established companies tend to issue regular dividends as they seek to maximize shareholder wealth. Go to Reuters’ stocks main page. Enter a ticker symbol in the View Overview For blank. Select the Financials radio button to the right of the red search button, and then click the red search button. In the new page that appears, scroll down to the dividends section. In the Dividends table, (using General Electric as an example), you can see what a company’s dividend yield is now and what it was on average over the past five years. 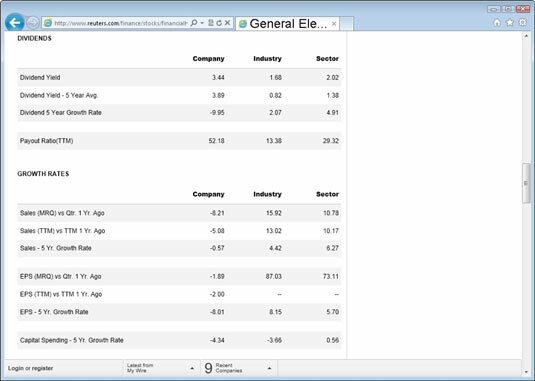 You can also see what kind of dividend yields other companies in the industry pay. The following table shows what kinds of dividends are typical in various industries. Companies in the following sectors and industries have among the highest historical dividend yields: basic materials, oil and gas, banks and financial, healthcare and pharmaceuticals, utilities, and REITS. Declaration date: The day the Board of Directors announces their intention to pay a dividend. On the declaration date, the Board will also announce a date of record and a payment date. Date of record (ex-dividend date): The day when the stockholders are entitled to the dividend payment. A stock will usually begin trading ex-dividend or ex-rights the fourth business day before the payment date. In other words, only the owners of the shares on or before that date will receive the dividend. Payment date: The date the dividend will actually be given to the shareholders. Most dividends are paid on a quarterly basis. For example, if a company pays a $1 dividend, the shareholder will receive $0.25 per share four times a year. Some companies pay dividends annually. A company might distribute a property dividend to shareholders instead of cash or stock. Property dividends can be any item with tangible value. Property dividends are recorded at market value on the declaration date. The percentage of net income paid out as a dividend is the dividend payout ratio. This ratio helps project a company’s growth. Actually, the retention ratio (the amount not paid out to shareholders in dividends), is used to project growth. This company paid out fifty percent of its profit to shareholders during this year. Some online brokers and companies that sell their shares to investors directly allow you to use dividends paid by a stock to buy more shares of the stock. These programs are called dividend reinvestment plans (DRIPs). Dividends are automatically reinvested. The process becomes entirely automated and requires no more attention or monitoring. Many dividend reinvestment plans are often part of a direct stock purchase plan, and the investor can automatically purchase additional shares of stock through checking or saving accounts. Purchases through DRIPs are subject to little or no commission. DRIPs allow the purchase of fractional shares. An investor can enroll a limited number of shares in the DRIP and receive cash dividends on remaining shares.